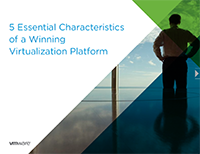 Read about the benefits of implementing the tools that provide an intimate understanding of the vSphere environment and the needs of organizations using virtualized infrastructure in this vmWare report. To manage dynamic virtual and cloud environments, companies need to rely on purpose-built solutions that are built for for physical environments to manage virtual systems. vSphere with Operations Management offers you the world’s most trusted virtualization platform with critical operational capabilities for performance monitoring and capacity management.